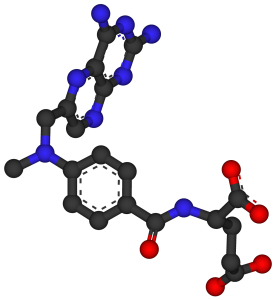 Methotrexate (rINN) /mɛθɵˈtrɛkseɪt/, abbreviated MTX and formerly known asamethopterin, is an ant metabolite and antifolate drug. It is used in treatment of cancer, autoimmune diseases, ectopic pregnancy, and for the induction of medical abortions. It acts by inhibiting the metabolism of folic acid. 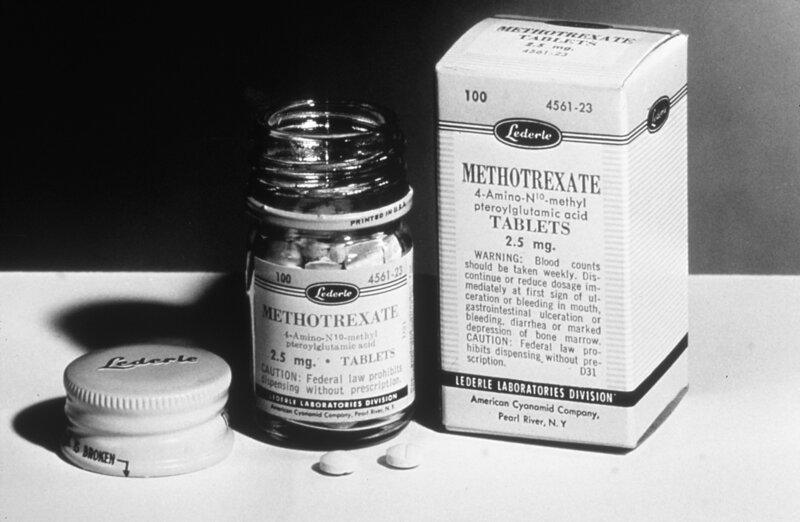 Methotrexate began to replace the more toxic antifolate aminopterin starting in the 1950s. The drug was developed by Yellapragada Subbarao. Methotrexate was originally developed and continues to be used for chemotherapy either alone or in combination with other agents. It is effective for the treatment of a number of cancers including: breast, head and neck, leukemia, lymphoma, lung, osteosarcoma, bladder, and trophoblastic neoplasms. It is used as a treatment for some autoimmune diseases, including rheumatoid arthritis, Juvenile dermatomyositis, psoriasis, psoriatic arthritis, lupus, sarcoidosis, Crohn’s disease, and many forms of vacuities. Although methotrexate was originally designed as a chemotherapy drug (in high doses), in low doses methotrexate is a generally safe and well tolerated drug in the treatment of certain autoimmune diseases. Because of its effectiveness, low-dose methotrexate is now first-line therapy for the treatment of rheumatoid arthritis. Though methotrexate for autoimmune diseases is taken in lower doses than it is for cancer, side effects such as hair loss, nausea, headaches, and skin pigmentation are still common. Though not everybody is responsive to treatment with methotrexate, multiple studies and reviews showed that the majority of patients receiving methotrexate for up to one year had less pain, functioned better, had fewer swollen and tender joints, and had less disease activity overall as reported by themselves and their doctors. X-rays also showed that the progress of the disease slowed or stopped in many patients receiving methotrexate. It has also been used for multiple sclerosis but is not approved by the Food and Drug Administration. Methotrexate is commonly used (generally in combination with misoprostol) to terminate pregnancies during the early stages (i.e., as an abortifacient). It is also used to treat ectopic pregnancies. It can be taken orally or administered by injection (intramuscular, intravenous, subcutaneous, or intrathecal). Oral doses are taken weekly not daily. Routine monitoring of the complete blood count, liver function tests, and creatinine are recommended. Measurements of creatinine are recommended at least every 2 months. There are no reports of toxicity following acute oral ingestions and most cases with severe effects are from dosing interval errors (dose administered daily instead of weekly). High-dose intravenous methotrexate chemotherapy with acute kidney failure can result in severe toxicity. Inadvertent intrathecal overdose can result in severe and life-threatening CNS toxicity. Ingestion of less than 500 mg methotrexate in adults, or less than 5 mg/kg methotrexate in children, is unlikely to cause toxicity. Methotrexate is most toxic when the dosing interval is decreased, most commonly as an error from weekly to daily, especially if weekly doses are taken for more than 3 consecutive days. Intravenous methotrexate doses more than 400 mg/m2 generally require rescue calcium foliate therapy. Such high doses should be monitored by an oncologist. In rare cases, high-dose intravenous methotrexate can cause acute kidney failure. This is a life threatening toxicity and immediate treatment with antidotal therapy is indicated. A clinical error where an intravenous preparation is given intrathecally will result in over administration. Whilst an uncommon error, it can rapidly develop into a life-threatening neurotoxicity. CNS toxicity (particularly with intrathecal overdose)—seizures, coma, chemical meningitis. The most common adverse effects include: ulcerative stomatitis, low white blood cell count and thus predisposition to infection, nausea, abdominal pain, fatigue, fever, dizziness, acute pneumonitis and rarely pulmonary fibrosis. 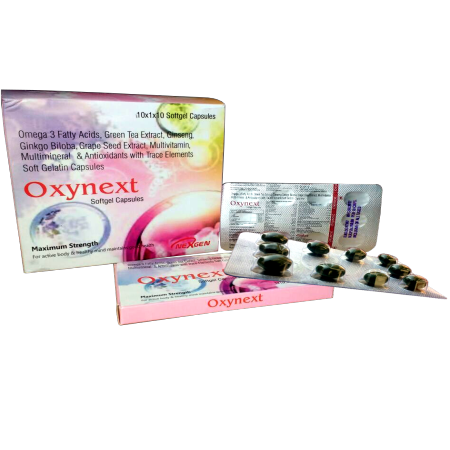 Methotrexate is a highly teratogenic drug and categorized in pregnancy category X by the FDA. Women must not take the drug during pregnancy, if there is a risk of becoming pregnant, or if they are breastfeeding. To engage in any of these activities (after discontinuing the drug), women must wait until the end of a full ovulation cycle. Central nervous system reactions to methotrexate have been reported, especially when given via the intrathecal route which includes myelopathies and leucoencephalopathies. It has a variety of cutaneous side effects, particularly when administered in high doses. Generally, the more “nonspecific” action a pharmacological substance has, the more possible side effects can be expected. Methotrexate has, like all cytotoxic substances, a broad array of possible adverse effects. Methotrexate is thought to affect cancer and rheumatoid arthritis by two different pathways. For cancer, methotrexate competitively inhibitsdihydrofolate reductase (DHFR), an enzyme that participates in the tetrahydrofolatesynthesis. The affinity of methotrexate for DHFR is about one thousand-fold that of foliate. DHFR catalyses the conversion of dihydrofolateto the active tetrahydrofolate. Folic acid is needed for the de novo synthesis of the nucleoside thymidine, required for DNA synthesis. Also, foliate is needed for purine base synthesis, so all purine synthesis will be inhibited. 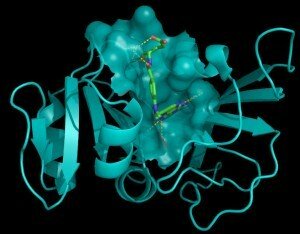 Methotrexate, therefore, inhibits the synthesis of DNA, RNA, thymidylates, and proteins. Methotrexate acts specifically during DNA and RNA synthesis, and thus it is cytotoxic during the S-phase of the cell cycle. It therefore has a greater toxic effect on rapidly dividing cells (such as malignant and myeloid cells, and gastrointestinal and oral mucosa), which replicate their DNA more frequently, and thus inhibits the growth and proliferation of these noncancerous cells, as well as causing the listed side effects. Facing a scarcity of dTMP, rapidly dividing cancerous cells undergo cell death via thymine less death. For the treatment of rheumatoid arthritis, inhibition of DHFR is not thought to be the main mechanism, but rather the inhibition of enzymes involved in purine metabolism, leading to accumulation of adenosine, or the inhibition of T cell activation and suppression of intercellular adhesion molecule expression by T cells. In these cases, patients should supplement their diets with foliate. In its low-dose regimen methotrexate blocks the binding of interleukin 1 beta to the interleukin 1 receptor on target cells. Methotrexate is a weak dicarboxylic acid with plan 4.8 and 5.5, and thus it is mostly ionized at physiologic pH. Oral absorption is saturatable and thus dose-dependent, with doses less than 40 mg/m2 having 42% bioavailability and doses greater than 40 mg/m2 only 18%. Mean oral bioavailability is 33% (13-76% range), and there is no clear benefit to subdividing an oral dose. Mean intramuscular bioavailability is 76%. Methotrexate is metabolized by intestinal bacteria to the inactive metabolite 4-amino-4-deoxy-N-methylpteroic acid (DAMPA), which accounts for less than 5% loss of the oral dose.